Last Sunday, Feb 23rd, saw the second club reliability trial for 2014. The weather forecast for Sunday Feb 23rd was dire with wind and rain. As it happened the participants in the clubs 65 mile reliability trial on that day only had to contend with the wind. Sixteen club members were joined by ten visitors, with eighteen signing on to achieve an 18 mph, and eight a 15 mph average speed over a rolling route which went out to Tarvin via, Church Minshull, Cotebrook and Utkinton, returning to Congleton through Ashley, Delamere, Acton Bridge, Great Budworth, Knutsford and Lower Withington. Only two riders actually beat the faster target speed, but most of the faster groups were within the ten per cent deviation allowed. All of the slower group were within their target plus ten percent. The rider times varied between 3 hours and 32 minutes to 4 hours 10 minutes to complete the route. In a reliability trial riders choose a target time based on either a 12.5 mph, 15 mph or 18 mph average speed, but the strong wind made the fastest target difficult on the day. Prior to this, the first of the clubs 2014 Reliability Trials was held on Feb 9th. There was a choice of either a 29 miles or 49 mile route. This year a total of 53 riders participated of which 25 were CCC members. This was a huge increase on 2013 when the day attracted a total of 22 riders. The weather was at least dry, although with a strong SW wind. This helped on the first part of the route which went up to Bosley and then via Fools Nook to Gawsworth and Broken Cross, before heading on to the Wizard on Alderley Edge. The shorter route turned back through Birtles and returned to Congleton by way of Siddington, Newsbank and Giantswood Lane. The longer route went into the wind through Nether Alderley, Ollerton, Middlewich out to Coppenhall before turning back, with a tail wind again, through Haslington, Hassal Green, Smallwood and Astbury, to finish with tea and biscuits in the Rugby Club. There was a set route, but some did their own variations. Mike Jones and Charlie Evans got extra training by doing a deviation which took in the cobbled climb of Swiss Hill in Alderley Edge. They are preparing to ride the Tour of Flanders Sportive in Belgium in April. The series continues with a 100 mile reliability ride on the 9th March. On March 16th Leek CC are staging the Paul Derbyshire Memorial Reliability ride together with their prize presentation. The ride is a 52 mile route into the Derbyshire Dales. Signing on from 8.00-8.15am outside Den Engel, Stanley St, Leek. Riders off at 8.30am. In between the two recent Reliability rides, the club run on Sunday 16th was to the Shire Horse Sanctuary at Cotebrook. Wayne Powell, Bill Boynton, Sue Blake, Roy Hayhurst, John Broadbent, Chris Gledhill, Stephen Kirkham, Denise Hurst and Andy Farr enjoyed a steady ride out through the Cheshire lanes before returning to the club by approximately 3pm. The weather was excellent for February, which was lucky for all who made the trip. This Thursday Feb 27th, the fourth in the clubs series of bike maintenance evenings takes place in the Rugby Club at 20:30 hours. The subject is brakes. Last week Feb 20th covered the transmission system. Derek Coates a mechanic from Congleton Cycle Centre demonstrated how to fit a new chain and sprockets and how to get derailleur gears perfectly adjusted. 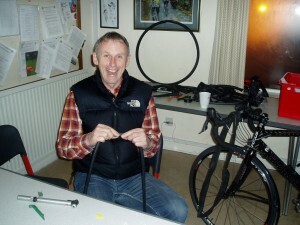 The week before members were entertained by a demonstration on how to check tyres, change and repair punctured inner tubes, before getting the chance to do a repair for themselves.